Born: 20 June 1825, Doeningshagen, Posen, Prussia. Died: 30 August 1889, Bloemfontein, South Africa. Carl Johann Gottlieb Krause was born of German speaking parents in the district that is now Poznan, in Poland. He was trained as a missionary of the Berlin Missionary Society, but also attended lectures at the Military Medical Institute in Berlin. In 1850 he married Friedericke Anna Kellner of Berlin, elder sister of Bernhard O. Kellner*, and was sent out to South Africa where he worked at the society's mission stations near Pniel in the Transvaal and at Bethanien, north of Philippolis in what is now the Free State. In 1854, soon after the formation of the Orange Free State Republic, Krause abandoned missionary work and settled in the small town of Bloemfontein as a pharmacist. As there were no medical practitioners in the town he also practiced medicine, even though he lacked formal qualifications. In June 1856 he was formally admitted as the first medical practitioner in the Orange Free State, mainly so that he could act with authority as a state witness in the murder case against Charles L. Cox, who was sentenced to death for poisoning his wife and two daughters. Krause performed autopsies on the victims. The evidence delivered by him and Francis H.S. Orpen* was published as Strychnine onderzoeking... (Strychnine investigation; Cape Town, 1856). As the only medical practitioner in Bloemfontein for many years (until the arrival of his brother in law, B.O. 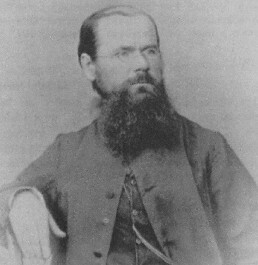 Kellner, in 1863), he built up a successful practice, was personal physician to the Free State presidents, and became well off. He acted as medical officer for the district and introduced vaccination against smallpox in the Orange Free State in October 1858. The vaccine was received from Cape Town and he forwarded supplies to other towns in the territory. He was also the first medical officer associated with the mental hospital (founded in 1889, later Oranje Hospitaal). Krause associated himself with the pro-republican Dutch Party and was not popular among the English speaking section of the population. However, he was a cultured person with wide general knowledge and played an active role in public affairs. For example, he served on the municipal council of Bloemfontein from its inception in 1859 to 1867, was a member of the Volksraad for Bethlehem from 1863-1866, was a foundation member of the Bloemfontein Club, served as treasurer of Grey College and a member of its council, and was a member of the council of the Eunice Dames Instituut. He was an enthusiastic gardener, planting trees and cultivating vegetables, and has been credited with introducing potatoes north of the Orange River. He and his wife had eleven children, several of whom became prominent citizens of the Orange Free State. Krause recorded meteorological observations at Bloemfontein for a period of ten years. When the honorary curator of the National Museum of the Orange Free State, Dr H. Exton*, went on an extended visit to England in 1883 Dr Kellner was appointed acting curator, but he resigned after a few months and was replaced by Krause. He served in this position until Exner's return late in 1886. Badenhorst, A.R. Gesondheid en die mediese professie in die Oranje-Vrystaat, 1864-1871. South African Journal of Cultural History, 1992, Vol. 6(1), pp. 19-24. Dictionary of South African biography, Vol. 5. Pretoria: HSRC, 1987.